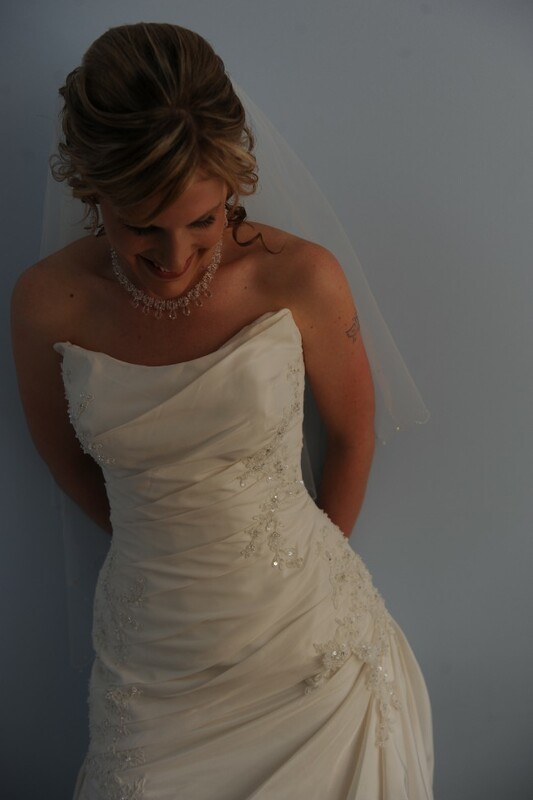 Stunning Size 10 slim line Wedding dress that showed off my curves beautifully. The dress is Ivory in colour, made from satin material & features a sweetheart neckline, sparkling rhinestones/crystal detail, tulle underlay and lace overlay. The dress is gathered from the bodice down to the waistline on one side and mid thigh on the other side, beaded along each side of the dress and around the back and train. Lace underlay that goes down to the ground and around the edge of the train. I felt so comfortable and beautiful in this dress and did not want to take it off at the end of the day. The back of the dress has a small button for you to be able to pin the train up and dance the night away without having to hold the dress around your hand as the train is quite heavy. I purchased the dress from Bridal Avenue in 2009. I am petite up the top and hippy down the bottom so this dress fitted perfectly. The dress has a corset back so can be made looser or tighter to suit a slightly bigger bust. I was a 10B at the time of wearing this dress and had breast pads sown into the dress so I did not have to worry about wearing a bra. My height is - 165cm and I wore the dress with 75mm heels and the dress was just off the ground at the front. The Wedding veil has crystals hanging around the trim and is included in the sale. The dress has been professionally dry cleaned by cleaners who specialise in Wedding Dresses and is stored in an airtight Wedding Dress box. The dress is in immaculate condition and only worn once. If you are coming to try on please no fake tan or make up.